My creative space has always been mobile. Whenever we need space for something else, I have to move. The last move was my giving up my “studio” as I like to call it or my “rrrooomm” sounding like Tim Horton’s Roll up the Rim” accent that my husband calls it to Oma (my mother in law). I think I got the better deal. It’s bigger, brighter and has a wooden floor. Yeah!! Verdi, my canary likes it better, too. He has a bigger window at ground level. 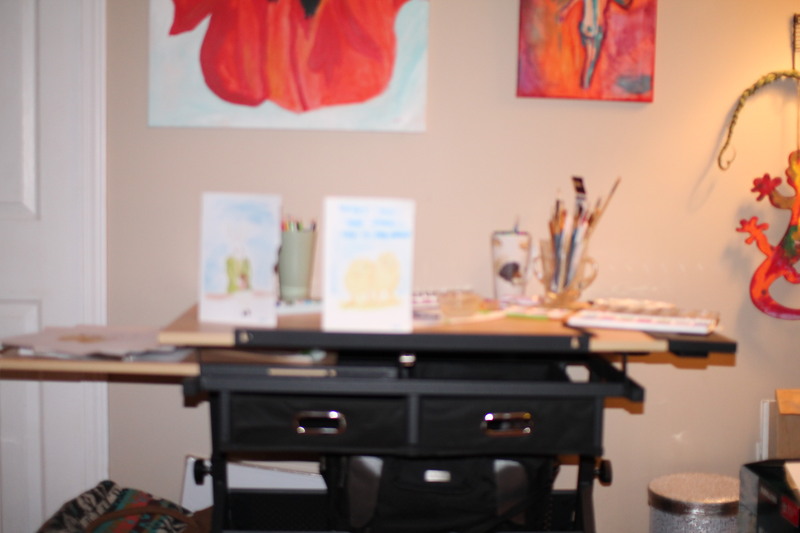 I bought a new desk so I would have more room to paint. It will tilt and I can have all my supplies closer. 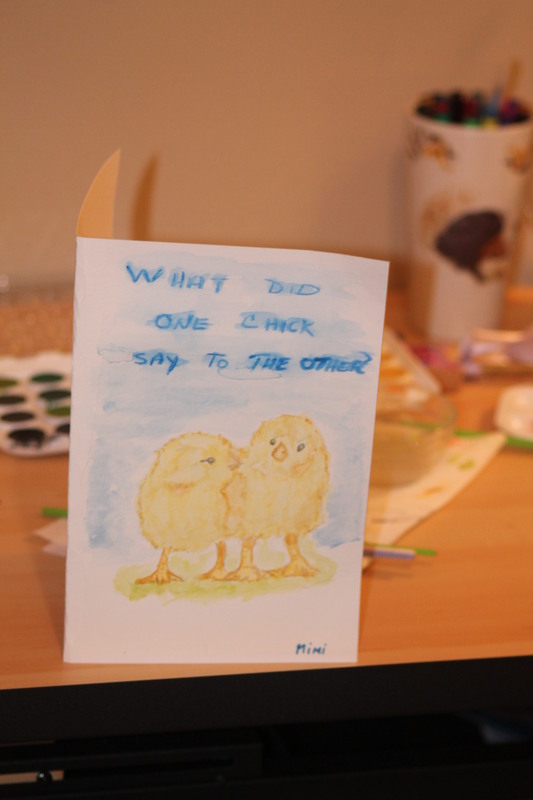 I spent a very enjoyable afternoon today painting Easter cards for the grandkids. 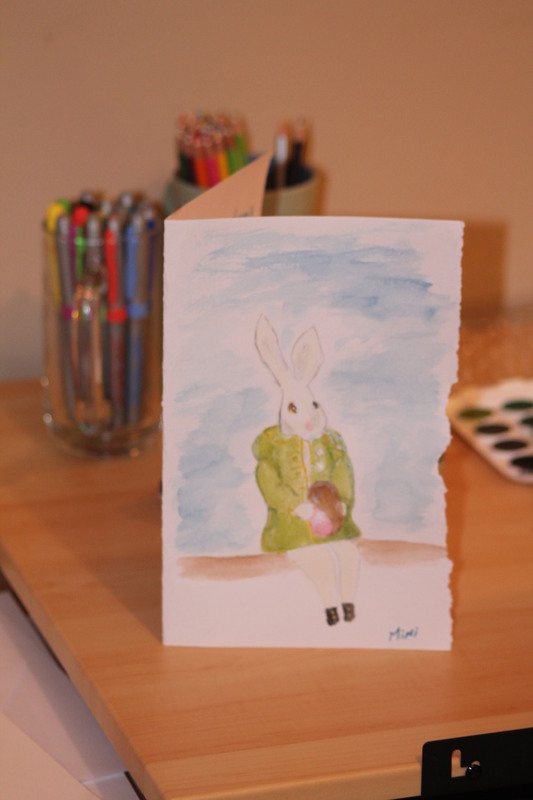 Giorgia is old enough now and an artist in her own right to really appreciate this type of card. Gianluca and Stella are still young and they really like the crazy music or talking cards that Papa likes to buy them. 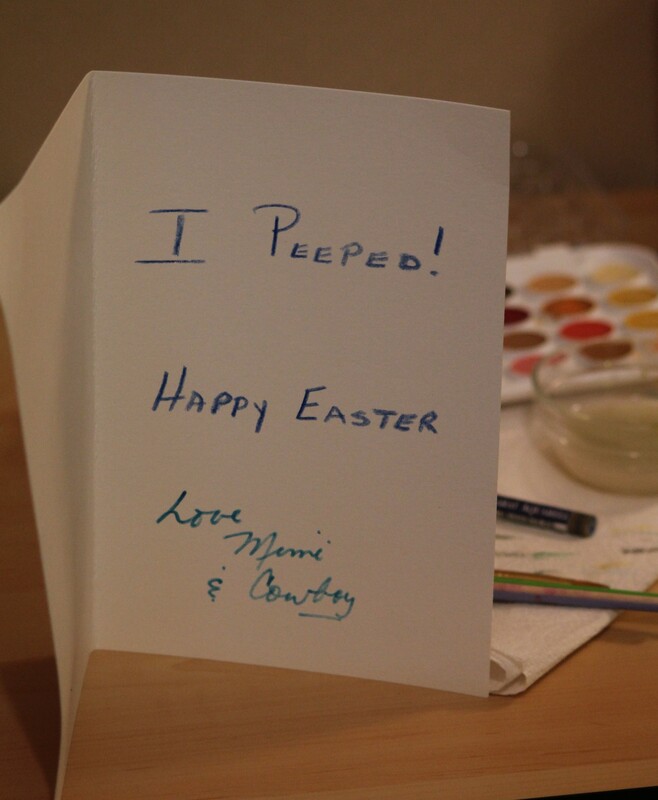 I figured I would still make them a card but would try to bring it down to their sense of humour. When I am not writing, I am usually busy with other things. Even if there has been a drought in blog posts, rest assured I am doing something creative. After years of suffering doubt on my ability to be “artistic”, I have given up the notion and decided that yes, maybe… I can paint. I am inspired by A Mighty Girl Blog I usually follow for great book tips for my granddaughters and by Brain Pickings, a curated website by Maria Popova. Her posts on creativity have given me a reason “be like water”! 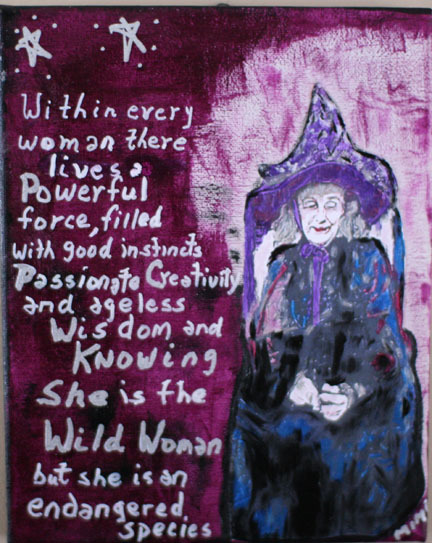 This is a mixed media I created for my sister (the epitome of a “wild woman”) for Christmas. What a cute, dignified bunny, all dressed for Easter like we used to be. I miss it. I remember going to church for Easter with a new pair of shoes (white, one of two pairs we got every year, the other ones were in September for school) and new gloves and maybe a hat. It was definitely different then. Mimi, thanks so much for visiting my site and choosing to follow along. Thanks for writing with so much courage. I am really enjoying and learning from it.